Feral House and Process Lupercalia Party! Celebrate Wolves, Yé-Yé Girls, Witches, Feral House & Process Media! It’s a full moon on Saturday, February 15, the day celebrating the Roman wolf festival Lupercalia. It’s also the perfect night to celebrate Feral House’s new Yé-Yé Girls of ‘60s French Pop book, and Feral House and Process Media’s releases for the new year. The lovely white witch Maja D’aoust (who co-wrote The Secret Source: The Law of Attraction and its Hermetic Influence Throughout the Ages) will speak about the pagan Lupercalia ritual. We’ll have a freshly printed and bound copy of Hashish, The Lost Legend, which some have said is the most extraordinary special edition they’ve ever seen. Adam Parfrey will discuss the recent and forthcoming Feral House and Process Media releases, including Chemtrails, HAARP and the Full Spectrum Dominance of Planet Earth, Citizen Keane: The Big Lies Behind the Big Eyes, and Black Metal: Evolution of the Cult. 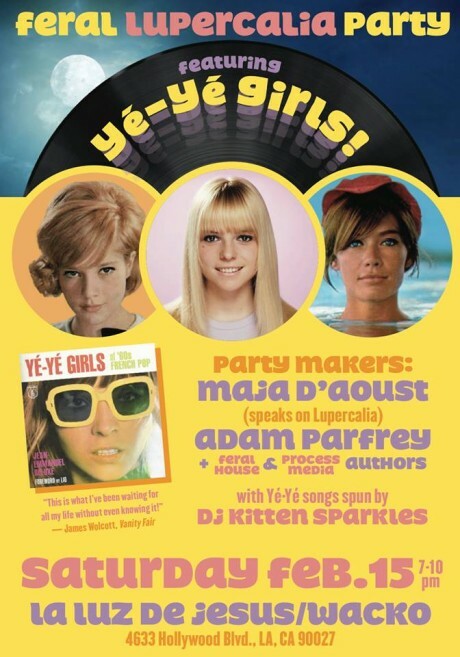 Adding more delirium to the festivities, DJ Kitten Sparkles will spin prime examples of the Yé-Yé Girls experience. This event will be held at Los Angeles’ Wacko and La Luz de Jesus Gallery, 4633 Hollywood Blvd., from 7 – 10 pm on Lupercalia, Saturday, Feb. 15.